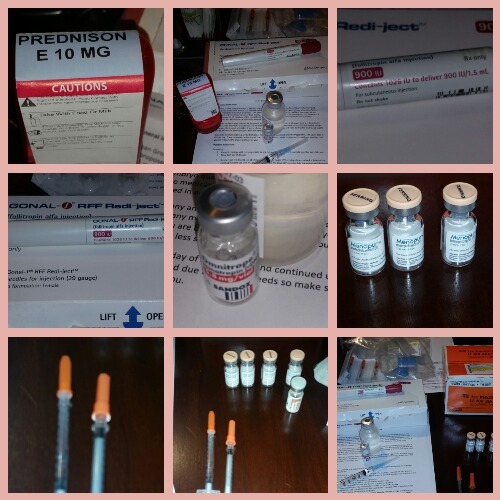 Tonight, I mixed my meds and injected them with ease. For some reason, I am a bit tired already. Thank goodness there are no headaches with the Lupron and the nausea that I had the first two days on HGH dissipated. My mom had her first chemo treatment with Taxol yesterday and so far, she is doing very well. She seems to have a lot more energy, but I am sure it is because they doped her up with steroids. LOL. She has been moving furniture in her quilting studio all day ! This afternoon, she had to go back to her doctor’s office to get the Neulasta shot, which will hopefully bring her white blood cell counts back up to a normal range. I just hope that this round of chemo, which she has 3 more treatments, spaced out 2 weeks apart, does not wear her down too badly. Right now, the effects on her are just exhaustion and her taste buds being off. If the food is spicy, she loves it ! Everything else tastes weird. This entry was posted in Health, Infertility, IVF, Single Mother By Choice and tagged Breast Cancer, IVF, Single Black Woman, Single Mother By Choice, Stims. Bookmark the permalink. Wow that’s amazing you can give your own injections. I started 13 rounds of iron injections in December and they wanted me to give them myself and I about passed out even thinking about it. Luckily now I just get them every two weeks! Anyway good luck! Good luck! Hoping for a good report tomorrow! I really hope the meds help her WBC. I was half expecting you to say they were giving her Neupogen. Wouldn’t that be an interesting coincidence?! LOL. They do try to push Neupogen because it is a lot cheaper. She refused. She has top notch health insurance and they will pay the $9800 for the Neulasta. Neupogen is $300 a vial and would last several chemo sessions. She said she did not feel comfortable injecting herself and since she pays out of the arse for health insurance, she wants top shelf LOL. She is doing well. She is getting excited because me egg retrieval is next Friday ! She may go with me since she doesn’t have chemo again until the 4th. I see from where you get some of your feistiness – your mom sounds like her own best advocate too! I hope she can come with you. Because this will be the one! I get it from her father and her mother’s sister. My mom got feisty with age. I came out of the womb taking no prisoners and with a lot of mouth. My mom used to be very quiet and more doormat like. Not any more ! lol. I hope she comes too because it is hella boring in Albany ! I got a lot of rest last time, but I was bored except the one date I went on while there. 🙂 YES !! This is THE cycle ! Twins ! !